(Insert very well mixed and arranged kitschy Muzak) … Aaaand we’re back with another Kush Audio review. This time audio and podcast mad scientist Gregory Scott of UBK brings us a plugin version of his hardware EQ by the same name. 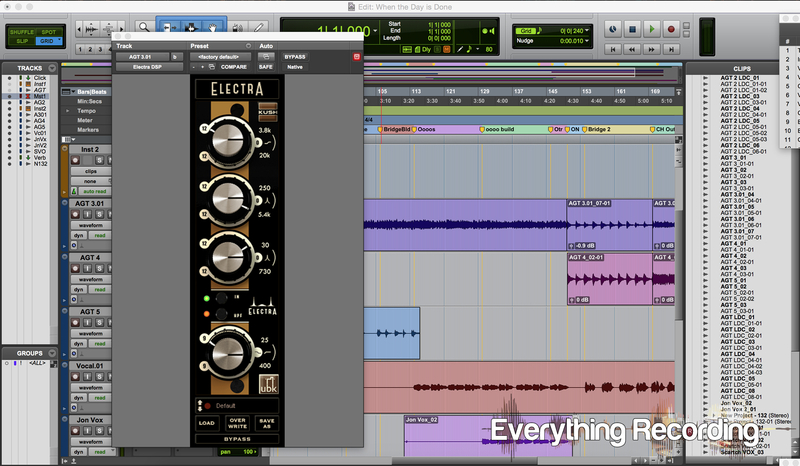 Electra puts a transient spin on normal EQ and like all things Kush, has a personality all its own. What we have here is a 4 band EQ with a controllable High Pass filter all packed into a somehow modern but still retro looking 500 series interface… much like its hardware counterpart. The first thing you will notice is the interface only has frequency values showing the corners frequencies of each band and dB value. There are no visuals showing just which frequency or gain level you are adjusting. This may feel cumbersome and frustrating at first but there is a method to Mr. Scott’s madness. If you’ve had any interaction with the Kush family, this approach to mixing is completely on par with the company’s philosophy. They just want you to make what sounds right, they don’t judge how you get there, and sometimes the very barriers that hinder productivity are in the sheer onslaught of information on your screen. They want you to turn knobs until they sound right. Electra DSP takes the training wheels off. I digress… Back to the bands. All of your bands were scrupulously created with love by UBK himself so you know you’re getting the goods. Your high pass filter is based on a butterworth filter, which has a 12db per octave rolloff with a slight bump of resonance at the corner. This filter can also be bypassed using the HPF button just above the low band and is adjusted using the bottom outer knob. This baby goes from 25Hz all the way to 400Hz and finds a way to cut what needs to be cut while leaving the rest in tact. The low band is a shelf fixed at 90Hz and gives a very tight response without causing your mix to crumble into a flabby mess. The high band is a sweepable shelf that spans 3.8kHz to 20kHz and put all the sheen in all the right places. The real magic lies in the mid bands where you get 2 of these bad boys, one low mid ranging from 30Hz to 730Hz and the other high mid ranging from 250Hz to 5.4 KHz. What makes these EQ’s stand apart is the Q interaction with the gain. Electra has a custom ratio of gain to q interaction. As you boost your frequency, the Q will narrow at the peak, giving you more transient snap. This behaves more like a traditional analog EQ but with more vibe given the way UBK makes the two work together. The result is a focused punch to the area you are boosting. The interaction works the same when cutting frequencies, helping you cut out those odd resonances without having to bother with the Q all together. Subtle when used lightly, powerful when cranked. It’s like autopilot for your mixing. In operation, the EQ is no nonsense and straightforward. Having no numerical values forces change in the mix approach, breaking conventional patterns and forcing the engineer to rely on feel. It’s freeing not to be tied to convention by knowing exactly what frequency you are adjusting. This can be the go to EQ when you’re not sure what you want but know you need something. What makes this achievable is not just in the fact that there’s no numbers, but the way the EQ deals with the content in the background. The EQ plays off of your actions and adds or subtracts exactly what needs to be taken out in a way that gives the content vibe and character, like that golden tint on a low rider car. You don’t just end up with a resonant frequency cut from an acoustic guitar; you end up with a new texture. Even heavy handedly, the EQ still brings something unique to the table without overcompensating. When reaching for an EQ, for a track, you can look at this one and honestly say, “Well, it definitely ain’t gonna hurt it”. Overall Kush has created another tool to add to the arsenal that does to every band what the Clariphonic does to the high frequencies. Electra allows you to get out of your own way by removing any distractions and getting you to the meat and potatoes of your tracks. I could also throw it across a session with no bog on the system. As of the current release, there were no presets but I’m sure this will be fixed on the next update. And with this plugin release, you can finally mix an entire project using Kush DSP plugins! On another related note, you should be listening to the UBK Happy Funtime Hour. If you’ve ever wanted to hear a pro audio podcast with two very well informed, affable people telling you like it is in a room with just a small a gas leak (in a good way), you’ve come to the right place. Seriously, these guys give extremely useful advice in a hilariously entertaining way. The recently rebranded “Nathan Daniel” and already branded Gregory Scott seem to have a great balance. I don’t know if they plan this but it seems on each segment they trade off being the straight man and the funny guy. Best pro audio podcast out there by far. It’s the only podcast I’ve gone through and listened through several times to soak up all the greatness. All hail the Howard Stern of Pro Audio Podcast.